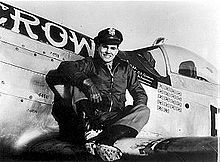 Clarence Emil “Bud” Anderson (born January 13, 1922) is a retired officer in the United States Air Force and a “triple ace” in World War II. During the war he was the highest scoring ace in his P-51 Mustang squadron. 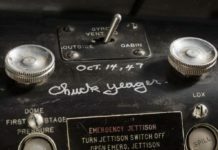 This was the same squadron as well known test pilot (and first pilot to break the sound barrier) and ace Chuck Yeager, and they have remained lifelong close friends. Towards the end of Anderson’s two combat tours in Europe in 1944 he was promoted to major at age 22, an extremely young age even for a highly effective officer in wartime. After the war Anderson became a well regarded fighter test pilot, and a fighter squadron and wing commander. 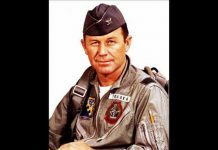 He served his wing commander tour in combat in the Vietnam War. He retired as a full colonel in 1972, after which he worked in flight test management for McDonnell Douglas. 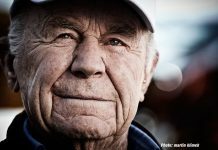 A member of the National Aviation Hall of Fame, Col. Anderson has remained a sought after speaker at aviation and military events well into his 90’s. Anderson was born in Oakland, California, and reared on a farm near Newcastle, California. In January 1942, he enlisted in the United States Army as an aviation cadet and received his wings and commission as a second lieutenant in the U.S. Army Air Forces in September 1942. Anderson flew two tours of combat against the Luftwaffe in Europe while with the 363rd Fighter Squadron of the 357th Fighter Group, based at RAF Leiston, England, and was the group’s third leading ace with 16¼ aerial victories. His P-51D-10-NA Mustang, AAF Ser. No. 414450 B6-S, nicknamed Old Crow (after the whiskey of the same name), carried him safely through 116 missions without being hit by fire from enemy aircraft and without Anderson ever having to turn back for any reason. He returned to the United States in February 1945 as a major. 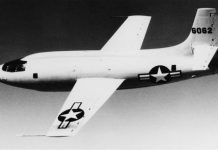 With over thirty years of military service, Anderson was a test pilot at Wright Field following the end of World War II, where he also served as Chief of Fighter Operations, and later at Edwards Air Force Base, where he was Chief of Flight Test Operations and Deputy Director of Flight Test. He also served two tours at The Pentagon and commanded three fighter organizations at the squadron and wing level. 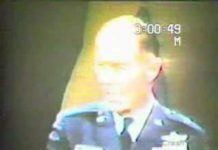 From June to December 1970, he commanded the 355th Tactical Fighter Wing, an F-105 Thunderchief unit, during its final months of service in the Vietnam War, and retired as a Colonel in March 1972. He was decorated 25 times for his service to the United States. Bud married Eleanor Cosby, on February 23, 1945. 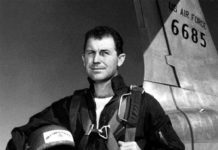 She died on January 30, 2015 in Auburn, Calif.
After his retirement from active duty as a colonel, he became the manager of the McDonnell Aircraft Company’s Flight Test Facility at Edwards AFB, serving there until 1998. 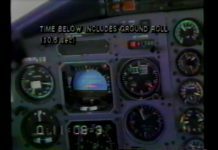 In 1990, Anderson co-authored the book To Fly & Fight—Memoirs of a Triple Ace. 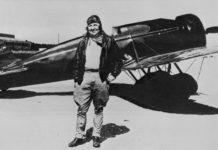 On July 19, 2008, Anderson was inducted into the National Aviation Hall of Fame. 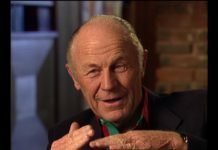 Bud Anderson as he appeared in 2011. Anderson is seated second from the right, in the white cap. This picture was taken at EAA AirVenture 2011, as Anderson tells a large crowd his war stories. He sits next to a P-51 Mustang painted in his World War II colors. Jump up^ “Yeager, An Autobiography”, Chuck Yeager and Leo Janos, Bantam Books, 1985. Jump up^ “P-51 Mustang “Old Crow” World War 2 artwork”. Cebudanderson.com. 1944-07-11. Retrieved 2016-12-16. 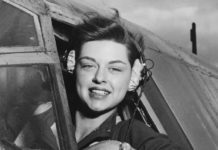 Jump up^ “Eleanor Anderson Obituary – Auburn, CA | Auburn Journal”. Legacy.com. Retrieved 2016-12-16.